Workers process information on an IBM data processing machine. 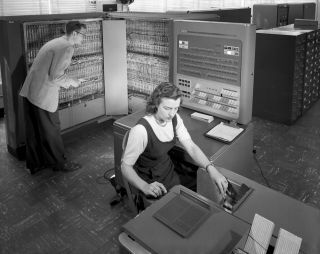 In this historical photo from the U.S. space agency, a man and woman are shown on March 21, 1957 working with an IBM type 704 electronic data processing machine used for making computations for aeronautical research. While desktop computers and even smartphones of today can pack the power of supercomputers from the 1950s, the IBM type 704 played an important role in the history of computers. It was the “first mass-produced computer with core memory and floating-point arithmetic,” according to an account at Columbia University. NASA has long sought to use the most powerful computers of each era, to crunch incredible volumes of data generated by astronomy observations as well as the design, testing, creation and managing of spaceflight machines and missions.